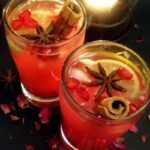 Spiced Pomegranate Spritzer Mocktail –This spiced pomegranate spritzer mocktail is an easy, refreshing, and delicious drink mainly made with fresh pomegranate juice, some spiced syrup and aerated water(soda water). This gorgeous drink not only adds value to our taste but also healthy. 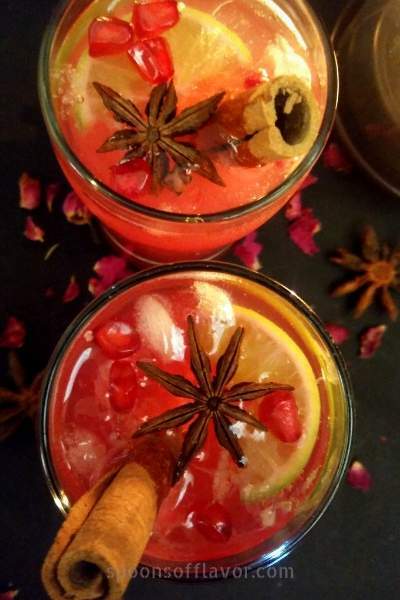 A perfect summer drink or mocktail for festive occasions. Like Valentine’s Day, Christmas and New year parties or even birthdays. The aerated water is nothing but carbonated water. Where water is infused with carbon dioxide gas under pressure. This produces a bubbly drink which is known as sparkling mineral water, soda water, club soda, and fizzy water. Furthermore, this is 100 times less harmful than the sugary soft drinks. Here to make it more appealing I have garnished this with star anise and cinnamon stick. But it is also perfectly delicious without those fancy decorations. So make this for a crowd or your family or a couple of you and your favorite person and enjoy this spiced pomegranate mocktail! Cheers!!! This spiced pomegranate spritzer mocktail is a refreshing, and delicious drink mainly made with fresh pomegranate juice, spiced syrup, and aerated water. Heat 1 cup water in a saucepan by adding sugar, cinnamon stick, star anise, and cloves. Once the water reaches its boiling point reduce the flame to simmer. Cover and let it cook until it reduces to half of its quantity. Once done, remove from heat and let it completely cools down. Remove the spices. Then divide the spiced sugar syrup into two serving glasses; pour half cup pomegranate juice to each glass. Then add soda water, lime juice, and black salt, lemon slices, pomegranate seeds, and crushed ice cubes. stir gently. Serve immediately by garnishing with cinnamon stick and star anise. 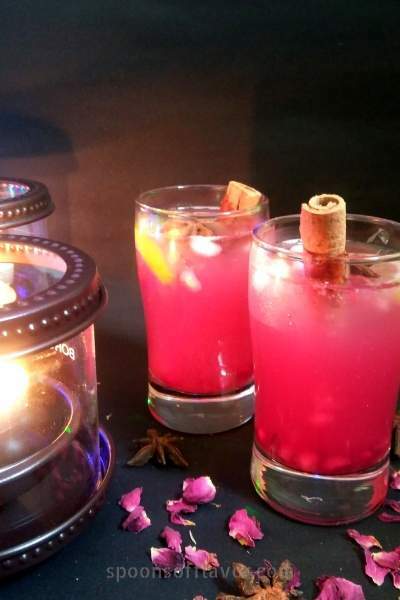 Let me know your thoughts about this spiced pomegranate spritzer recipe in the comment section below. Also, you can connect with me on Instagram, Facebook, Pinterest, and Twitter. 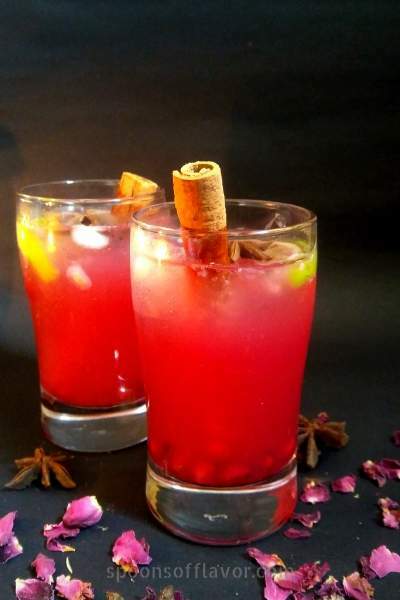 This ‘Spiced Pomegranate Spritzer Mocktail’ is contributed to the FB group Healthy Wellthy Cuisine for the theme ‘VDaySpecialAtHW’. Here are some contributions from others for the same theme. Such a beautiful share for this Lovely theme. Loved the presentation!! I am sure it must be very delicious. Spritzer looks so good, loved the way you have put it here. Loved it and on my list to do. What a healthy and pretty drink to celebrate the season of love!! 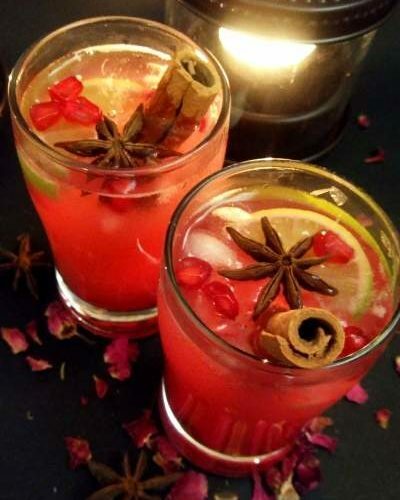 I love the flavours of the spices and the healthy pomegranate juice.. looks so delicious!! So refreshing and colorful!! I have been having a lot of pomegranate lately! This drink sounds delicious and spicy! Have to try this! Thanks for sharing dear!